The newest army for the Mortal Realms has descended from the clouds with their new models and Battletome in tow. 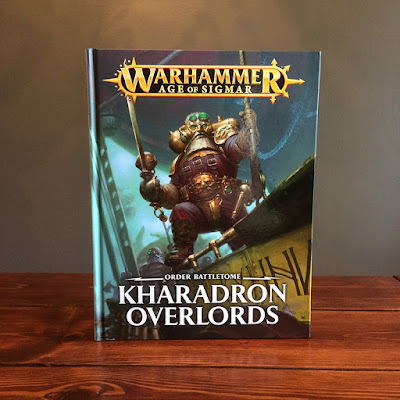 So how do the Kharadron Overlords fit into the ongoing tapestry of AoS and what other surprises does their new book contain? Well, grab your top hat and monocle, get your mustache guns ready, and read on to find out! When the pictures for this army were first released by GW it's safe to say I was blown away! Not only did the sculpts themselves look awesome, but the whole concept was so unique. 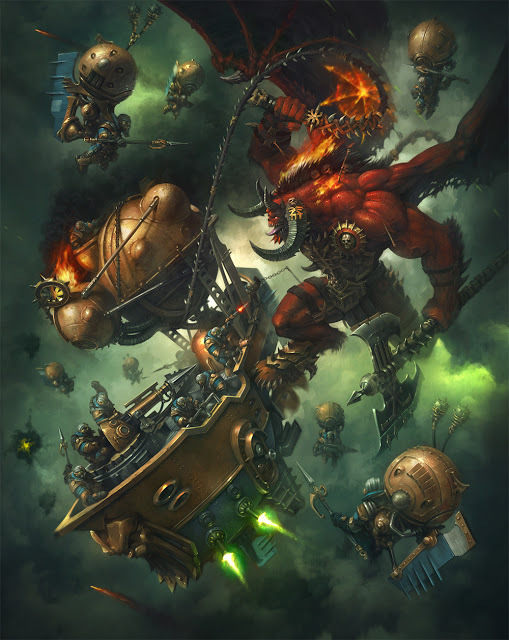 They are duardin in air ships fully embracing the steampunk vibe that was only hinted at by the dwarfs of 8th edition Warhammer. I was lucky enough to get a review copy of this new book from Games Workshop. The book has a pretty great looking cover, with one of the Arkanauts standing heroically on one of their airships. You can tell right away that they are both very steampunk, and also slightly piratical in nature, so mission accomplished! While it's not one of my favorite pieces of cover art, it's also by no means on the lower end of the spectrum. It does a great job at encapsulating the army and looks stunning as usual. Once you crack it open you are greeted with the backstory for the Kharadron Overlords as well as some of the best internal artwork to date. The Overlords started out as just regular duardin, living in their Karak mountain fortresses and being typically duardiny. When the Age of Chaos broke across the Realms, the mountain empire of the duardin in Chamon crumbled, with all of the duardin themselves either slaughtered or fleeing for their lives. Some of those who fled went to the skies to escape Chaos. The duardin had a few tiny sky ports at the time that were still fairly new. 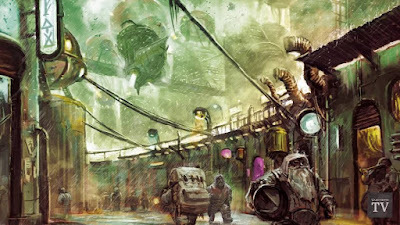 These refugees fled to those sky ports, originally as a temporary measure, but once they discovered aether-gold they abandoned all plans to return to the surface and became the Kharadron Overlords. Now these sky ports are the enormous Baraks, gigantic floating cities. There are six major ports, but there are a bunch of smaller ones too, allowing you to come up with your own color scheme and backstory. Aether-gold is a near magical substance, a gaseous form of gold that is used to power their weaponry and keep their ships and cities afloat. This, of course, makes it very, very important to the Kharadron Overlords, since without it their cities would literally fall from the skies. The Overlords don't really believe in magic or the gods (except for a few of them), but instead place their trust in science. To them all magic is just a form of science that they don't understand yet, including the aether-gold. This explains why their technology is so advanced. They have devoted all of their time, unmolested by Chaos, into pursuing science and have a magical (scientific) way to power all their tech. As such, their weapons don't shoot solid rounds, but instead shoot out aether-shot. Think lasers, but more fantasy-esque. These Khardron Overlords are all about profit and trade, and are slightly piratical in their nature. Aether-gold is very valuable and is what is most sought after, but they are also interested in anything else they can turn for profit. This originally led to many conflicts between the different sky ports. 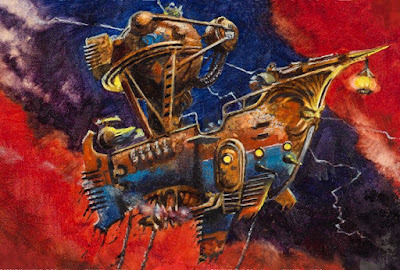 To settle this matter the disparate sky ports created the Kharadron Code, or The Code for short. This established how their society is governed and ensured peace between the different Overlords forces. Though they don't have a single ruler and have abandoned the idea of kings, they do have a ruling council. Each major sky port has at least one member on this council. The richer your sky port is, the more members you have on the council. At the moment Barak-Nar has the most members. These are the purple and cream guys in all the promotional images. Now that the Age of Sigmar is upon them, the Overlords have ended their isolation and seek to establish trade agreements with all of the non-Chaos forces out there. There's a really cool couple of pages that goes over the six major sky ports and has a picture for each one. These are all pretty breath taking, some showing off a far off view of the sky port, others showing a snap shot of life their. There is one that reminds me of Coruscant, with all of the air traffic criss crossing it, and another with giant statues of the ancestor gods. The latter is for the one city that still venerates the gods. They read very much like classic duardin in that they value grudges and seek to settle all of them, so if you like the old style duardin, but want to have them flying around in sky boats, these guys are probably for you. My favorite though is a picture of a street in one of the sky ports that has a heavy Blade Runner/Mass Effect vibe to it in my opinion. You also learn about the individual quirks for each of the cities. The books goes over a bunch more here too, including the different guilds within their society, like the Endrinmasters and the Navigators. You also learn a lot about how their ship's crew function and a whole bunch more. 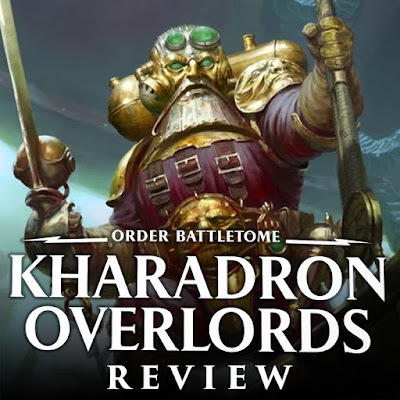 The only thing I was disappointed with that was left out was where the name Kharadron Overlords came from. Why did they start calling themselves that? What does it mean? Maybe that's just me, but I always enjoy the backstory on things like that. That very small quibble aside, I love the background lore for the Overlords! GW did an outstanding job at making them feel completely believable and a great fit for AoS as well. I'm excited to learn more about these guys in future campaign books and novels. The sky ports seem like a fantastic opportunity to explore their culture and the way they interact with the other races has so much potential. We get a little section on some of their weapons and armor, including that really cool picture of the duardin standing in front of his armor. After that is the timeline we have come to expect, and again, there are a bunch of cool story hooks in here that I hope they expand on later, if not, it gives you something to expand on with your own army. There is also a color scheme section that shows you the colors for all six of the major sky ports, and a couple of maps showing where those major ports currently are at in Chamon. The Battletome then delves more into the way their fleets are organized and the individual units. You learn about Brokk Grungsson, and how he rose to the rank he holds. Unlike more typical duardin, your station in the Overlords isn't determined by lineage, but by your deeds and how much profit you bring in, meaning any duardin can reach any rank if they are good enough. It also goes into all of the ships and their crew. Though we only see the Ironclads, Frigates, and Gunhaulers there are other, much larger ships, that they have a few pictures of in the book. Some of these are large freighters, but a few are even larger battleships or aircraft carriers. It would be cool to see these later on from Forge World, or even just as a conversion from a skilled hobbyist. The Grundstok Company is expanded upon as well. It's a large, well funded company that specializes in warfare and has training facilities in all of the major sky ports. Where most of the Arkanauts are privateers of sort, the Thunderers of the Grundstok Company are trained soldiers, who hire out their services to whatever admirals can afford them. Next is the model gallery section. I loved looking over all of the cool models. They did some cool things to make it look like the army was in the clouds in some of the shots. 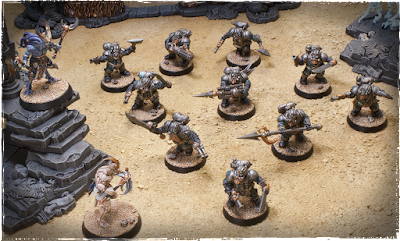 The studio army is painted in a greyish blue color, which helps you see the potential of the models in something besides the purple of the 'Eavy Metal army. I had planned on using a similar color scheme for mine before I saw it was an official one. I, of course, had to change mine then so I can have something unique to me. The 'Eavy Metal section is gorgeous, with each of the ships getting their own two page spread so they can show off all of the detail. There is also a rather extensive hobby section after this. They show you in five steps how to paint each of the six major sky ports, with pictures for each step. This is super helpful and I hope they do this in future books as well. I definitely nabbed a few ideas from here for my own models. They also show off a few other things, like the best sub-assemblies to paint your models in, how to do some cool kitbashes with their models, painting freehand symbols, and more. Now we're onto the rules proper. Instead of starting off with the generic Allegiance Abilities we actually get the rules for each of the six major sky ports first. Before I talk about these though I need to explain how the Allegiance Abilities work. All of this is a bit of a departure from past armies, in that you get to customize your abilities to fit your army. The abilities are centered around the idea of the Code and is structured like a contract. Each army gets one Artycle, one Amendment, and one Footnote. There are six choices for each of these, and you can either roll or pick. 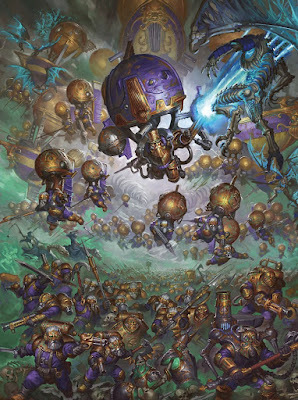 They are all pretty good in their own way, and the fact that you have to pick three different things hopefully means we will see a lot of variety in how the different Overlords armies play. These abilities range from helping out your bravery tests, allowing ships to run and shoot in the first turn, granting re-rolls, and so on. The Footnote is a once a game ability, while the other two stay in play the whole game. Each of the six major sky ports has all three of these pre-determined and also grants you an additional Footnote that you can pick, plus an extra ability to further enhance that sky port's theme. For example, Barak-Nar, the purple and cream one, is super advanced and anti-magic, so pretty much all of their heroes can unbind spells and they have further buffs to unbinding. Unlike past army special rules, like with the Stormhosts or Wargroves, you don't need to take any required battalions or units, and they don't cost any points at all! You just need to pick which sky port you are playing as and then you get to use those special rules, simple as that! Personally, I will be making my own sky port and picking my own Artycle, Amendment, and Footnote and sticking with it through each game. You also get six command abilities, all of which seem equally good to me, with maybe one or two stand outs. For the artifacts you get the ones your heroes can choose from, but you also get to pick one Endrinwork, which is essentially an artifact for your ship. This is in addition to your hero's artifact and you get to pick an additional one as well for each battalion you take. These do things like help out your movement or healing. The heroes can pick from either six different weapons, or six different pieces of armor, talismans, and other things like that. This is followed by the custom scenarios for the Kharadron Overlords. We get five of these this time, each with a different theme that fits the sky faring duardin. One has you rescuing the crew of a downed aircraft, while another has you staking a prospecting claim in enemy territory. These all seem pretty fun and I would love to give a few of them a try. Once again, it's missing any background stories, which is a little disappointing, but I guess I will just have to wait for the next campaign book to read some stories about these guys in battle. We also get the expected Path to Glory rules in here, with tables to generate all of your followers. The rewards for the different followers all seem pretty good as well. I'm thinking about playing some Path to Glory games with my Overlords since it seems like a great way to get games in while my force is still very small. 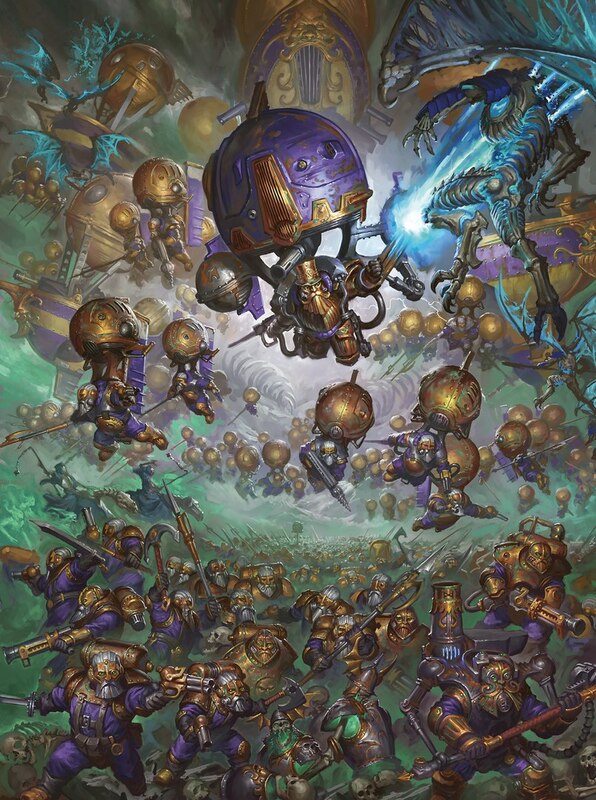 In a first for Age of Sigmar books, as far as I'm aware, there is also a section going over some basic Overlord's tactics and four example armies, each one themed around a different idea. This is a nice little addition and will be a great help to new players out there. 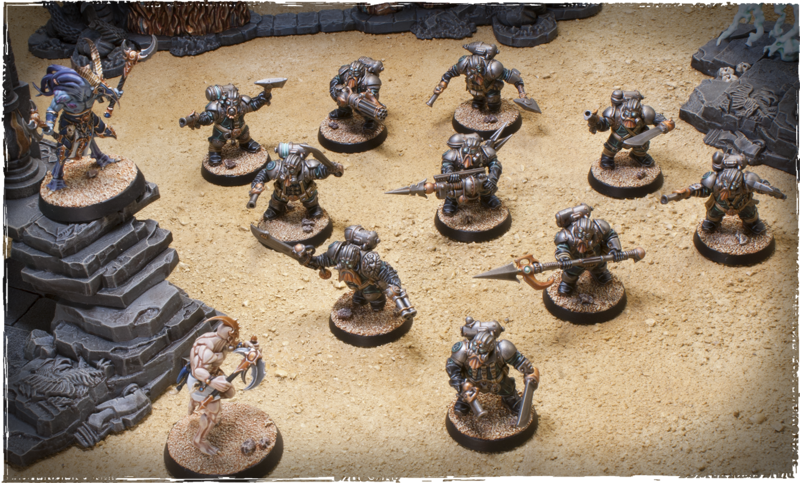 I'll certainly be taking a few of these suggestions into consideration since there really is no other army out there at the moment that you can use as a basis for how to play these guys. We get five different battalions for the Kharadron Overlords. The first one is the Grand Armada, the one that includes the three main ones plus an admiral. The three main ones all center around a different faction of the army. The Ironsky Command has all of your heroes, an Ironclad, some Endrinriggers, and a unit of Arkanauts. The one I think you will see the most of is the Ironsky Company, which is pretty much your meat and potatoes of the Kharadron Overlords. You need to take at least two Arkanaut units, and two Arkanaut Frigates and it gives you a few abilities, like your Frigates being able to add one to all of their attack characteristics in the first round. The last one centers around the Grundstock Thunderers and Grundstock Gunhauler, with some Skywardens thrown in for good measure. All of these seem fairly easy to collect with the Ironsky Company seemingly being an auto include since the Arkanauts are the only battleline in the book, and you'll most likely want a Frigate to transport them. So, by default you will probably already have the units for it. The last battalion combines the Khradron Overlords with some Stormcast Eternals in the form of Prosecutors and a Venator. This reminds me a lot of the Sylvaneth/Stormcast battalion from the Sylvaneth book and the Beast Raider/Ironjawz Battalion from the Beast Raider book. It lets you take other armies' units in your army while still maintaining your Kharadron Overlords allegiance. There are a total of twelve units in the book, with five heroes, four infantry units, and three sky boats. The first hero is the special character with the top hat, Brokk Grungsson. He seems pretty good, but I don't know how often we will see him on the tabletop. I hope we do see him though. Having him lead a bunch of Skywardens or Endrinriggers would look awesome, and his melee attacks are brutal. 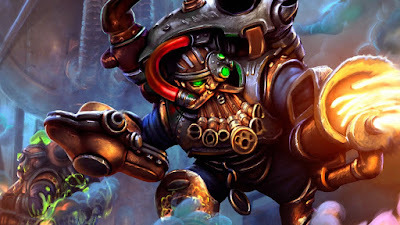 The next hero is the Admiral and I'm pretty sure we will see him in every pure Kharadron force. Besides Brokk Grungsson, he's the only hero with a Command Ability, making him pretty valuable. You can actually pick from one of three different command abilities each turn, meaning you can customize it a bit to your situation. He seems like he might be okay in combat too, especially if you buff him with some artifacts. The other three heroes are the Khemist, the Navigator, and the Endrinmaster. The Khemist seems like the best of the bunch to me, since he has an ability that lets you pick a friendly Skyfarer unit near him and add one attack to one of their weapon profiles. For example, you can add one attack to all of your Arkanauts' pistol attacks for that round. Skyfarers are any of the non sky boat units, so he can't buff the big guns unfortunately. The Navigator makes your movements a little better for your boats and can also unbind spells, and the Endrinmaster can help heal your boats and is no slouch in combat either. The Arkanauts themselves are pretty average, having both ranges and melee attacks, but not really excelling at either. You can equip them with some special weapons though, in the form of the Light Skyhooks, Aethermatic Volley Guns, and Skypikes. These can pump out a bit more damage, with the Skyhook doing the most at a -2 rend and D3 damage, but the other two aren't bad either. This unit also gets plus one to hit against Heroes or Monsters if they direct all of their attacks against it. The Endrinriggers look the most interesting to me. They are one of the units with the jump balloons on their backs, meaning they are fast and can fly. Their close combat attacks are also -1 rend with D3 damage, but only one attack a model. If you couple that with a Khemist though you can pump out some damage. They can also take a few special weapons in the form of a Skyhook or a Drill Cannon. Their Skyhook is a little better though, because if the unit you targeted takes an unsaved wound you can immediately move the Endrinriggers D6 inches closer to them, as if they are being pulled along. They can also heal wounds on your boats, and most importantly, the models look pretty awesome. The Skywardens are pretty similar, but are more combat focused. Their attacks have less rend, but they have more attacks to make up for it. These are the ones with the mines floating off their jump balloons. The boats, or Skyvessels, are definitely the main attraction in the rules. This is the first time we have seen vehicles that can transport models in Age of Sigmar. They are treated like monsters, with a high number of wounds and a decreasing set of stats as they take damage. The Ironclad is the big beast, and shows it with 18 wounds and the high number of shots it can put out. It can also carry up to 20 models, or 25 models if you want to overburden it. For each model it carries over 20 models you decrease its move characteristic by one. The Endrinriggers and Skywardens don't count toward this limit though, since they have a special rule that allows them to hitch onto the sides of the boat. Any unit with the Skyfarer keyword, which is everything in the book besides the boats, which are Skyvessels, can ride in one of the boats. They embark in the movement phase if they are within 3" of it, this can be at any point during their move. Once embarked they are essentially removed from the table and cannot be targeted or affected by spells or abilities, unless the rule specifically states it can. If the ship is destroyed, then all embarked models must roll a dice; on a one they die. Otherwise, any survivors are just set up where the ship use to be. Units can disembark in the hero phase and are just deployed within 3" of the ship and outside of 3" of any enemies, after which point they act normally for the turn. You can't disembark and embark in the same turn though. Honestly, it's a pretty simple and effective way to do the transport rule. The Ironclad also has a couple of other special rules to represent it being the flagship of the fleet. Think of them as mini command abilities. The Frigate is the main ship you will see the most. It has slightly less wounds, less firepower, can only carry a maximum of 15 models, but has a higher movement value. I would expect to see at least one, if not more of these in every Kharadron Overlords army. Also, when I say it has less firepower, that's less then the Ironclad. It can still put out a bunch of shots a turn. They both carry bombs and mines too, which is essentially how they fight in combat. The Grundstock Gunhauler is the smaller, more agile ship. It doesn't have a damage table but also can't transport any models. It's faster than both of its larger brothers, but has less firepower and wounds. It's essentially the fighter craft of the fleet. One cool ability it has is to take damage that the larger ships suffer if they are close enough, making them kind of like bodyguards. After all of the rules we get the points and battlefield designations. The only battleline in the book are the Arkanauts, so for a 2,000 point army be prepared to paint 30 of these guys. One big, and very noticeable omission from this book is the lack of core rules. The four pages of core rules for AoS are completely absent for the first time in any publication in the nearly two years that AoS has been out. This has gotten me very excited to see what surprises the General's Handbook 2 has in store for us. Could we be getting some major changes to the core rules of AoS? An AoS second edition perhaps, or an edition 1.5, or maybe just a consolidation of some of the FAQs into the core rules? Frankly, I love this book. Everything about it seems awesome. The army is completely unique, their play style is something we have never seen before in AoS, and even their Allegiance Abilities are approached in a brand new way. Not only is the army cool, but the Battletome itself is packed full of so much new content in the form of hobby guides and tactics. I have never been interested in a Dwarf/Duardin army before, but with these guys I'm definitely doing a small force at the very least. Their lore has me completely enthralled and the idea of running a small armada of these on the table would just look too cool to pass up. I've barely scratched the surface of the backstory in this book, so there is still a ton to read on your own. I've already painted up my first unit and have started on the other two, all of which GW was kind enough to send me for review. On Wednesday I'll have pictures up of my first unit as well as a bit of backstory for my own sky port, Barak-Mor. I definitely recommend picking this book up if you like Duardin, and if you're a fan of AoS I would say it's also worth picking up. It shows what awesome new directions GW is willing to take this game.